An active musician since early childhood, Erin Barra is a singer, songwriter, multi-instrumentalist, producer, consultant, and more. 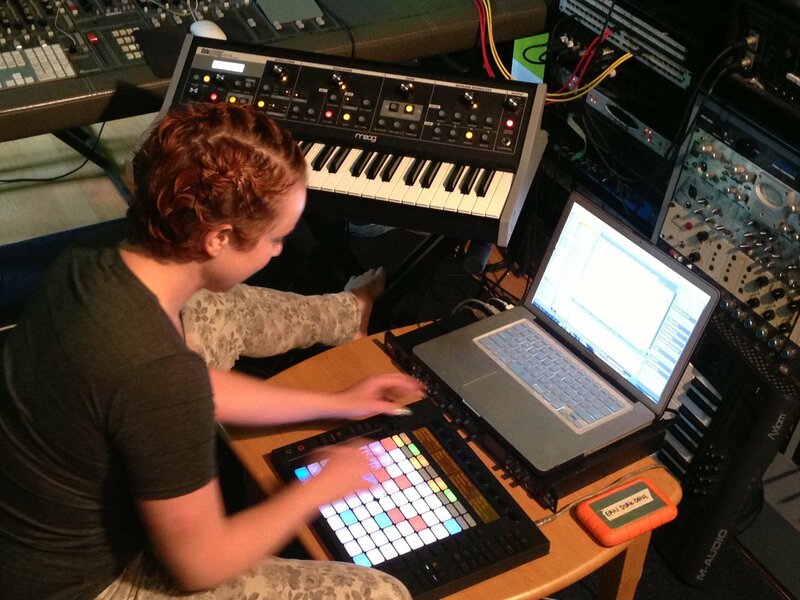 Within her many different projects, Ableton Live and Push have become the center of Erin’s set-up in the studio and on stage. We recently caught up with Erin to discuss her music, playing solo and with a band, and what’s next up in her busy career. I'm in the process of putting the finishing touches on a number of records I've been making with a few key producers in NY, mostly for other artists. Once that's done I'm looking at finishing up my fourth release (which I've been working on for two years already) and making important decisions about what I want for and from that. I've been doing a lot of consulting for bands wanting to integrate laptops into their stage performance. Sharing my experience and knowledge about Live has been very satisfying. Besides that, I always seem to have my hands in about five other things at any given time - whether it’s writing tech product reviews, co-writing with artists or learning new techniques and skills - I seem to keep myself extremely busy. When did you start working with Ableton Live? I got deep into Ableton during the summer of 2010, on the suggestion of a producer/DJ friend of mine, Gravytron. Neither of us had messed with the software and we literally spent most of an entire summer inside a room making beats and exploring Live 8 together. It started as more of an extension of my stage performance but has since become the foundation of my creative process in the studio and writing room as well. How does Live work with your solo live show setup and within more of an ensemble setup? When it's just me up there, I consider Live to be more of a conduit or instrument. I'm playing the computer in tandem with multiple synthesizers and MIDI controllers. When we incorporate it into a band type situation, Live literally becomes another member of the band that we have to play along with. To summarize, when I'm solo I'm playing Live, and when I'm with other musicians, we're playing WITH Live. Above: a track from Erin's new mixtape, Comma. As a singer-songwriter, what are your favorite tools or features in Live that allow you to create? I like to blend both Session and Arrangement View while writing. That way I can work on Arrangement and produce the song at the same time. I like to play with the order and length of sections a lot and triggering clips allows me to experiment without having to mess around in a timeline. Not only does this workflow save me a huge amount of time but it allows me to continue being creative without having to stop and switch to the technical side of using software. You've recently started working with Push. How are you using it live? How are you using it in the studio? When I'm on stage I find that people respond strongly to when I'm actually 'playing' Push, so I tend to work in Note mode a lot and keep things entertaining. I'm a strong believer in less is more so I think a little bit goes a long way, especially on stage. In the studio I do pretty much all my drum programming with Push and have begun to mix on it as well. In both cases it forces me to step away from the computer and use my ears more and I find that to be invaluable in any session. I also use it as a traditional MIDI controller as well in both settings. Want to learn more about Erin and how she uses Push? Don’t miss a free workshop and demonstration from Erin at Tekserve in New York City on July 18 - if you can’t make it in person, it’s available to livestream for free at Erin’s site.